"A wizard attempting to capture Death to bargain for eternal life traps her younger brother Dream instead. Fearful for his safety, the wizard kept him imprisoned in a glass bottle for decades. After his escape, Dream, also known as Morpheus, goes on a quest for his lost objects of power. On the way, Morpheus encounters Lucifer and demons from Hell, the Justice League, and John Constantine, the Hellblazer. This book also includes the story "The Sound of Her Wings" which introduces us to the pragmatic and perky goth girl, Death." Preludes and Noctures was my first ever full Graphic Novel read, and on the whole I enjoyed it. Obviously it's intelligent and well-written, as how could Gaiman ever do otherwise? but the format, which I've frequently struggled with and given up on in the past is a real stumbling block for me. "Think of reading a graphic novel like you'd watch a film", my colleague suggested. And whilst that might sound elementary, it helped. Reading for me is such a personal and creative process, but when someone lays everything out for me pictorially that process is completely changed. It's unrecognisable. There's absolutely no work for me to do, and I did need to learn to just sit back and "watch" as I read through it. The story is fabulous, imaginative and inventive, an original twist on age-old myth. Horror, legend and humour blend together wonderfully. The artwork is stunning, kind of...messy art, you know? Dirty art...gritty. A million miles from shiny, colourful Marvel-esque musculature. It's a real assault on the senses. A hugely different reading experience to the kind I'm used to. And it was fun. Would I read further into this series? Definitely. Will I become a fully fledged convert to the graphic novel format? No..far from it. I watch very few films, and even less television...my preference is to read because at that point it's my imagination that colours and fleshes out that of the author, and the two combine in a completely unique experience and that's the process that lights fires in my brain. Graphic novels take that away from me, and whilst I could enjoy a really good comic once in a great while, as I do films, it's not going to impact on my daily escape into non-graphical fiction. A very entertaining diversion though. 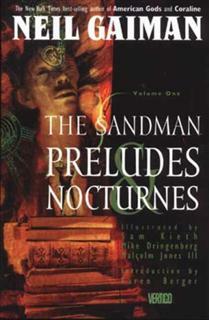 And definitely one I'd recommend to anyone else who enjoys Gaiman's novels.